Hootsuite founder and CEO Ryan Holmes grew up on a Canadian potato farm without electricity. He has since gone on to build the world’s most widely-used social media relationship platform. 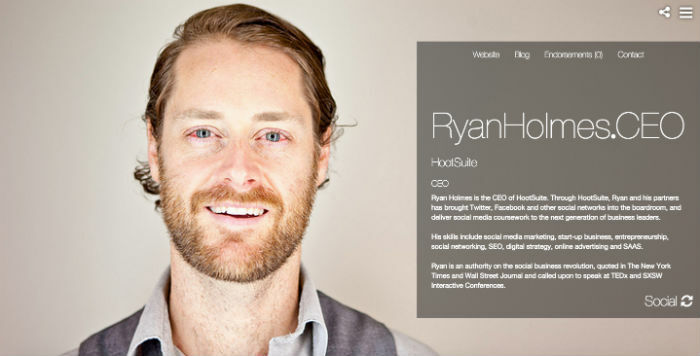 Today, his company Hootsuite has more than 10 million users, including 75% of the Fortune 1000 companies. Holmes has invested his efforts in making technology better from a young age. In the fifth grade, he won a grade school programming contest and was awarded an Apple computer. He promptly, and successfully, rewired his prize to run off of a car battery. Holmes began attending the University of Victoria in 1997 before dropping out to go work for a number of start ups. Ryan Holmes is a firm believer that CEOs should be using utisling social media in order to maximise their networking opportunities. He has recently published an article on it named "Why it's time CEOs (finally) got serious about social media". Otherwise, click 'Read More' below to learn more about Ryan's story and upbringing. Learn more about Ryan Holmes and the .CEO Network.